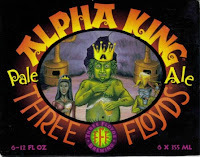 I was lucky enough in 2009 to get my hands on a few Three Floyds offerings, and Alpha King barely nudged out the Dreadnaught Imperial IPA as my favorite. It's simply a perfect pale ale. It starts with a potent hoppy aroma--obvious Centennials and Cascades. The musky, unfiltered texture makes it creamy but smooth. At 6%, it's incredibly drinkable, and as far as drink-in-bulk beers go, this is by far the best I've had. There's enough depth and flavor to enjoy a single bottle, but if I had time and an empty stomach, a six pack wouldn't stretch my stamina. The hops carry over to the taste, with a nice biscuit malt giving the beer balance and substance. Pale ales have a tendency to go one of two ways: hops overpowering the malt, or malt overpowering the hops. This one does neither and it's that balance that sets it apart from the standard, bland offerings you so often get from craft breweries. I snagged my six pack on a summer visit to the Chicago area, but now that it's available just across the border, I see many more of these in my near future. Thank you for the wonderful articles, let me very rewarding. Did you buy anything through the Internet? Recommend you click here, look like the style:wholesale jordan shoesand cheap jordan shoesDiscounted goods cheap nike shoesMany cheap cheap air jordan shoesthere're many discount air jordan shoes you'll like thatmbt shoes usaor hot kicksMaybe these will suit you cheap jordan kicksand custom jordan kicksclick crispy kicks shoesThe quality is very good wholesale nike shoesbuy lrg onlineIt's very affordable children's basketball shoesMany styles of waiting for you to choose women nike dunk low shoescheap nike shoes for saleor authentic jordansIf you can't wait to have them?